British Association of Clinical Anatomists, 2015. I have had the privilege of being the only physio to present at this years BACA, primarily to an audience of anatomists and surgeons. It was hard to follow on from an incredibly interesting and cutting edge presentation on hand transplantation (!!) but if we can bring things back to PFJ I’d like to share my key findings. This work is therefore in write-up with the goal of publication in 2016. Ultrasound measurement of vmo fibre angle and insertion level. Performed at baseline, 6 weeks and 12 weeks. All performed SQC and IRQ to light fatigue alternate weeks and then randomized into a group. Fibre angle increased from 0-6 weeks. Those that stopped the angle reversed. The x1/week reversed a small amount. 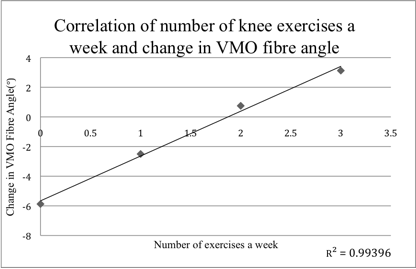 X2/week maintained the effect, x3 increased fibre angle further. Insertion level very difficult to draw conclusions as results in this small sample not significant. 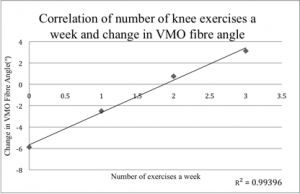 To maintain muscle architecture changes, 2 exercises x2 a week was the minimum. Of course in patients, the presence of pain may alter results, and the potential for increased function may help to maintain muscle architecture change. I will alert anyone on my mailing list when this work is published so don’t forget to pop your email in at the bottom of the page. Pretty nice post. I just stumbled upon your blog and wanetd to say that I have really enjoyed browsing your blog posts. In any case I’ll be subscribing to your feed and I hope you write again soon! Hi Michelle, So glad you enjoy them! There certainly will be more to come. Reading your posts is always a delight! I have been following you on Twitter and your blogs keep me abreast on the latest in the patella world. Thanks ! Great! I'm so glad you like it1 More to come... If you can come on my course you can have a whole day of it!! Thanks Conor. Some of the work is aleady published and the links to the papers are all on the about Claire page of my website. More also to come....!